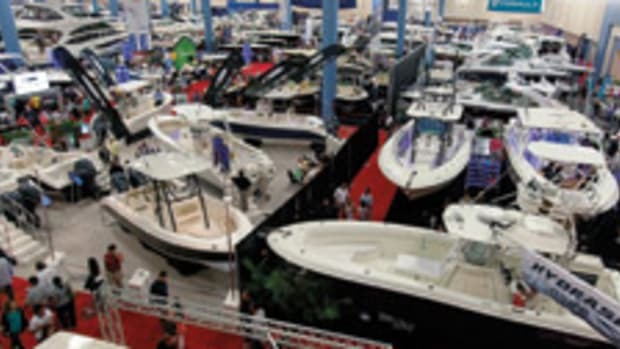 Approximately 600 boats and 750 exhibitors were waiting this morning to welcome crowds as the 42nd annual Newport International Boat Show opened in Rhode Island. Tens of thousands are expected to attend the four-day show, which began at 10 a.m. today and continues through Sunday at a 13-acre site along America’s Cup Avenue. Boats from 15 to 85 feet, as well as kayaks, inflatables, services, equipment, electronics and accessories, will be on display. Newport for New Products, the show’s recognition of the best new boats and products, has nearly 40 entries this year, the most since 2008. New sailboats from Dufour, J/Boats and Bavaria; new powerboats from Hunt, Hinckley, Jeanneau and Protector; and equipment from such companies as Forespar and Imtra are included. The program includes a People’s Choice Award and attendees will vote today. Click here for the digital 2012 Newport show directory. Discover Boating’s newest interactive event for sailors and powerboaters, the “Welcome to the Water Hands-On Training Series,” is a new feature of the show. The 60- and 90-minute clinics and three-hour seminars — all requiring preregistration and nominal fees to attend — take place on the water with a dedicated fleet of power- and sailboats. The hands-on events are taught by Coast Guard-licensed captains who are professional, certified instructors and provide in-depth training in a broad array of subjects. Sail America’s “Discover Sailing” initiative will offer free sailing demonstrations from the show docks at no extra charge beyond the show admission. Show hours are 10 a.m. to 6 p.m. today, Friday and Saturday; and 10 a.m. to 5 p.m. Sunday. Tickets purchased at the show today are $30 ($27 online, plus a processing fee). On the other days of the show, tickets are $18 ($15 online, plus a processing fee). On Friday, tickets are half-price for military personnel and Newport County residents. Children under 12 are free every day when accompanied by an adult. Free shuttle bus service will be provided from Easton’s Beach parking lot on all four days of the show.